So on the last day of 2010, with the second freeze of this winter upon Portland, it seems a good time to take a look at some plants that can easily deal with whatever zonal irregularities Mother Nature deals out this season. These are the Northwest natives that the Mulch Man loves and has incorporated into his part of the gardens at Longview Ranch. And the MulchMaid is happy to admit they look fabulous right now. Wishing you and your garden all the quiet joys of the season, whichever holiday you celebrate! We got away to Astoria for a long weekend. It was perfect: a little Christmas shopping, a lot of relaxing, eating great oysters and looking at houses for sale (we dream about living there.) On Sunday it dried up and we retraced our steps to a garden we had seen on on an earlier visit. The last time we were here, maybe 9 months ago, the homeowners had just begun this project and had the front garden of their house graded and set up in general planting areas. It wasn't evident at that point what they intended, plant-wise. Now it's abundantly clear - they LOVE evergreens! Like almost every piece of property in Astoria, the house is on a slope. This gave them an interesting perspective, but some challenges retaining the soil and in planting. Even if you pay all your bills on line, and keep up your correspondence by email, there's always something you need a stamp for. And for many of us, it's that time of year when we mail holiday cards to friends and family. So I was really happy to see the new crop of first class "Forever" stamps the Post Office recently issued. Each of these four designs is a finely executed botanical illustration of an evergreen conifer species. I'm back in the blogging fray with a Bloom Day post, and a "thank you" to those of you who inquired about my status. Life intervened, but I hope to be more regular again now. It may be Garden Blogger's Bloom Day, but there is only one plant blooming in the garden this month. And there are a few promising buds I can't resist showing as well. Fatsia japonica got slammed by our early cold snap, but amazingly, its slightly-tired blooms have been holding on through the ensuing rain and wind. I love their goofy, sputnik shapes. 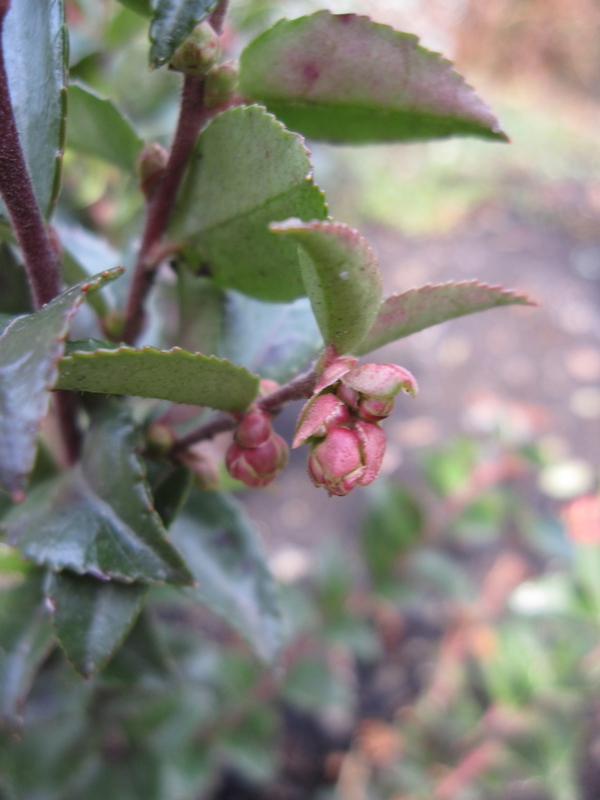 Vaccinium ovatum 'Thunderbird', the evergreen huckleberries from the UBC botanical garden are getting ready to bloom. Those two seem to be a little ahead of the other evergreen huckleberries that have been in for three years now. Also looking promising for next month is Arctostaphylos 'Martha Ewan'. It is so heartening to see these Pacific Northwest hybrids taking our weird weather patterns in their stride. Moving indoors the almost ever-blooming Streptocarpus, or Cape Primrose (a gift, so no variety name) is doing its darndest to brighten up a corner window. In sharp contrast to the ebullient primrose above is the quiet bloom of this Aglaonema. I even had to lift some leaves to expose it for this picture. 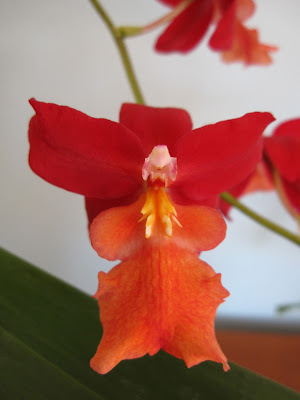 Lastly, a stunningly-colored oncidium whose tag, if it ever had one (you know how Trader Joe's is!) is gone. This is the second time this little orchid has bloomed, and the lovely color combination brings out my inner gypsy. Over winter, when gardening is at a minimum, it's so good to have these indoor plants to reward us. Although our last house got good daylight, we find our houseplants seem to respond even better to the big windows and bright life here at Longview Ranch. To see what else is blooming today, visit Carol at May Dreams Gardens.